Photoshop: All blending options turn to "Blending Options..."
After I imported a file for editing all options on right click turned to "Blending Options" and all options does indeed keep opening "Blending Options". 5. Make sure "Typekit sync" is checked on. 7. Open Photoshop via Creative Cloud. 8. Notice that all options have changed to "Blending Options". UPDATE: Closing and reopening Photoshop via Creative Cloud app has resolved the issue. Still amused. That is a strange one! If it comes back, please let us know. Could you please let us know if this issue comes back up again, ok? I have this same issue. 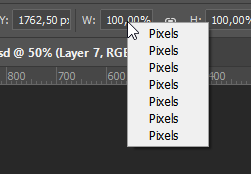 I got a web design file, I just open it to export some layers, and this happens, no export option under right click menu on layer. I'm on Windows 10. This also happens if I try to transform, I try to change units and only have "pixels" multiple times. Yesterday, after updating Photoshop, the porblem was gone. Today it's already present, so it wasn't solved by the update. Have you tried closing the file and PS, resetting prefs, and then trying again? I'd like to figure out the cause and a solution, but I'd also like to make getting you back working the first priority. Thanks for the quick reply, much appreciated! Happened when creating a new empty file. Resetting prefs solved it. I will report back if this happens again. What version of Photoshop were you running? What other apps did you have running? Did you launch and immediately hit this problem or did you do something else first? What did you do? This info would all be very helpful to figure out what triggers this issue. I'll be honest -- I'm stumped. I don't run the exact same setup, but mine isn't too far off. The only app that gives me pause would be your anti-virus. Please, the next time you get this, let us know and please include an inventory of what apps you had running at the time. I'm thinking something is gobbling up all of PS's resources, but I could be wrong.